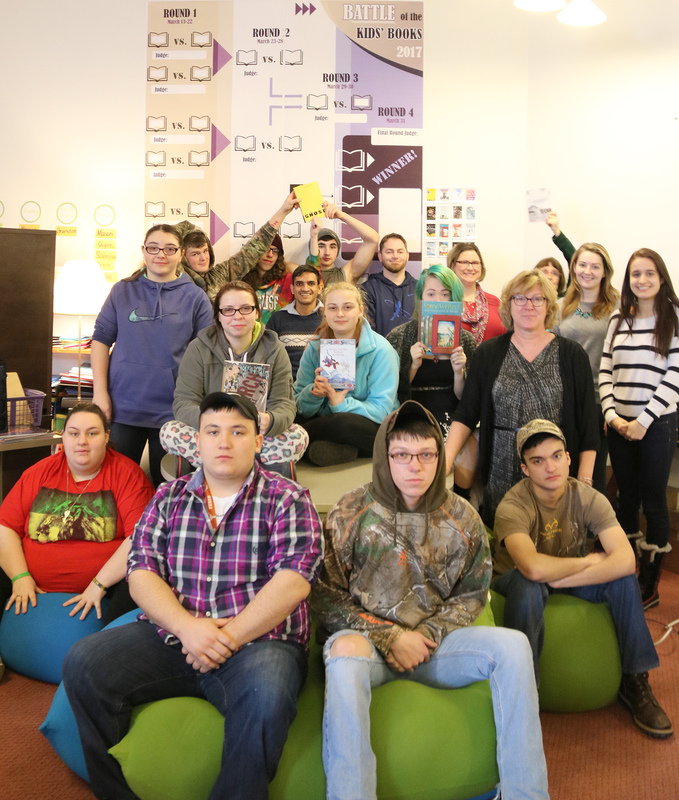 Local high school students enrolled in the Center for Instruction, Technology and Innovation’s Credit Accrual and Recovery for Everyone (CARE) program have embarked on a literacy quest to help the School Library Journal decide which book will be named the 2017 Battle of the Kids Books (BOTKB) winner. Students gather to prepare for the Battle of the Kids Books. The Alternative Education students will join several additional CiTi participants and reading enthusiasts from SUNY Oswego, where the CARE program is housed in Sheldon Hall, in an effort to expand a love of reading and meaningful conversations. The battle, referred locally as the “Oswego County Book Tournament 2017,” is a March-Madness-style tournament in which authors serve as judges and read two separate books to determine which book advances to the next round. Participating students will read several of the “Sweet 16” selections and lobby for their favorite book as they are narrowed down to the “Elite 8,” “Final Four” and head-to-head rounds. Sweet 16 books include: “Freedom over me” by Ashley Bryan, “Wet Cement, A Mix of Concrete Poems” by Bob Raczka, “When the Sea Turned Silver” by Grace Lin, “When Green Becomes Tomatoes (Poems for All Seasons)” by Julie Fogliano, “Thunder Boy Jr.” by Sherman Alexie, “The Sun is Also a Star” by Nicola Yoon, “Some Writer! The Story of E.B. White” by Melissa Sweet, “Samurai Rising: The Epic Life of Minamoto Yoshitsune” by Pamela S. Turner, “The Passion of Dolssa” by Julie Berry, “March Book Three” by John Lewis, Andrew Aydin and Nate Powell, “Makoons” by Louise Erdrich, “The Lie Tree” by Frances Hardinge, “The Girl Who Drank the Moon” by Kelly Barnhill, “Ghost” by Jason Reynolds, “Freedom in Congo Square” by Carole Boston Weatherford and R. Gregory Christie and “Anna and the Swallow Man” by Gavriel Savit. CARE Principal Robyn Proud said during last year’s battle, her students joined SUNY Oswego’s School of Education and Professor Sharon Kane to explore more engaging reading opportunities. In an effort to increase that effort this year, the partners recently welcomed Penfield Library at SUNY Oswego, the Oswego Middle School, CiTi’s Project Explore program, CiTi’s Bridges program and CiTi’s New Vision program as contest companions. River’s End Bookstore in Oswego will host a weekly BOTKB book club. At CARE, SUNY Oswego’s pre-service technology teachers will join the venture as they show CARE students how to create animated book covers. Thanks to SUNY Oswego’s Art Department, CARE students will be supplied with art kits to allow them to be more expressive in their response to the battle books. The high school students will also correspond with SUNY Oswego’s pre-service teachers to create a virtual book discussion. “It’s all alternative education, which is defined as choice,” Proud said.